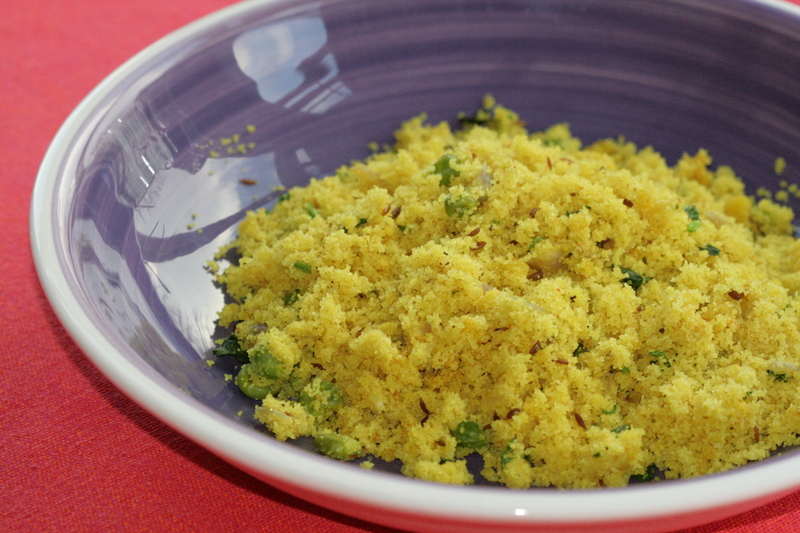 Tikhat Rava is not quite Upma but very similar to it since the base is semolina. This has been a favourite teatime snack ever since we were kids. It makes for a great brunch too. Heat the ghee just until it melts. Add in the semolina and roast until it starts turning light pink in colour. Take it off the heat and let cool. Heat the oil and add the asafoetida, cumin, chopped chilli and the curry leaves. When the cumin and chillies start to splutter, add in the onion and stir on a medium high flame until the onion starts to brown very lightly. Add in 1 ½ cups of water and wait for it to start boiling. Add in the peas and the semolina and mix well. You should still have a dry mixture as the water will have just about mixed with the semolina. Add in the salt and cover with a steel plate. Pour a little water into the steel plate, enough to cover the base. Let the semolina cook in the steam generated by this water in the plate. Turn the heat to medium. Stir after 6-8 minutes and check that the base is not browning. You can also taste the semolina at this stage to check if it is done. Garnish with coriander leaves and a squeeze of lemon juice. 1. You can add potatoes, peeled and cubed. Add them in at step 2 along with the onions. This entry was posted in Teatime snacks or Brunch ideas and tagged brunch, Maharashtrian, Pathare Prabhu, Pathare Prabhu recipes, PP snacks, rava, savoury semolina, semolina, shrimp, sooji, tea time snacks, teatime snacks, Tikhat rava, upma. Bookmark the permalink.